Water Based Primer. 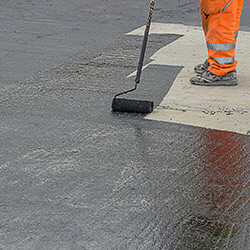 A one component, solvent based black bitumen primer with good adhesion to a variety of substrates and good water and alkali and acid resistance. For priming dry concrete decks. Used as a primer for ‘Torch-on’ bituminous waterproofing and for protecting cast iron pipes, fence posts and metal railings etc. where handling is minimal. Will seal asbestos fibres, binding them for encapsulation & sealing. Used as a primer or adhesive for ‘Malthoid’ roofing.